A series of containers for night-time. Sophisticated lines with color shading that establish clear breaks between the frame and the drawers, or with monochromatic finish. Each individual element plays a role in the architectural space with a warm colour palette. 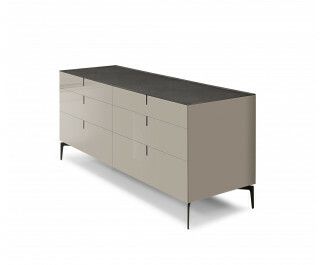 Dove-grey lacquered Meridien bedside table and chest of drawers. Painted steel top and base.